Cyrus DAC XP Signature review | What Hi-Fi? 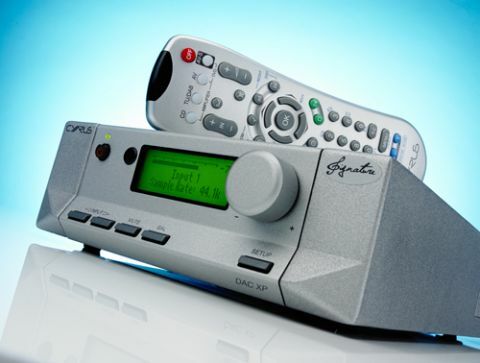 We reviewed the original Cyrus DAC XP back in 2005. Even then it seemed like a terrific idea; combining a DAC and high-quality analogue preamp in one box made so much sense. Of course, the idea is even more pertinent today. This Signature edition is the latest version of the XP, and is the result of work done to create Cyrus’s limited-edition Anniversary series of products. These were built to celebrate the company’s 30th birthday. Cyrus’s strength (and arguably its biggest weakness) is the half-width diecast casework it uses for all its products. On the plus side, this gives the brand a strong identity, and has rigidity and damping advantages over traditional bent-metal alternatives. Using the same casework across products and over the years – we’d guess the present design has been around for a couple of decades – breeds a great deal of loyalty from customers, but sometimes the unchanging face of the company’s output suggests not much progress is being made. Cyrus’s engineers have taken the opportunity to fine-tune the circuitry, and one such upgrade has involved switching to a new 32-bit DAC chip, used here in a dual-mono configuration to minimise noise and improve resolution. A great deal of care has been taken to reduce interaction between the analogue and digital circuits, and to ensure that the power-supply arrangements are as uncorrupted as possible. Nevertheless, there is the option to improve matters further, as we’ll find out later. Take a look around the back and you’ll find a packed rear panel. There are no fewer than five sets of outputs (split between balanced XLR and single-ended RCA) and an ample range of single-ended analogue, optical and coaxial inputs. What’s missing is a USB connection. This, more than anything, shows up the age of the basic design – it just wasn’t an important requirement eight years ago. How things change. Apparently, adding the input isn’t particularly easy. It requires a significant redesign of the product to make it happen. Cyrus would argue that the DAC XP is intended to partner its range of CD transports and streamers, so a USB isn’t needed. Also, it’s possible to buy USB-to-SPDIF adaptors if such an input is vital. Build quality is up to the Cyrus norm. The DAC XP Signature looks neat and well made, although it’s no better constructed than the company’s entry-level products (which retail for way less than a grand). If you’re looking for a true high-end luxury feel you won’t find it here. That’s the price of sharing the same casework across a range that starts off in the hundreds and ends up costing in the thousands. We also find the front panel display now looks a little old-fashioned. Cyrus has used this kind of LCD display for decades, and it shows in the lack of clarity. It’s time for a change here. Fortunately for Cyrus, these quibbles are soon forgotten once the XP Signature is used in anger. Cyrus products have always prioritised agility, precision and detail resolution above all else, and this revised DAC XP excels in all these areas. Regardless of input, there is just so much insight here. If you want to analyse the dense production of The Dead Weather’s 60 Feet Tall the Cyrus will lay it bare for you. Instrumental strands that rivals may submerge under the intentional grunge of the production remain easily heard. It all sounds impressively clean, clear and very controlled. Rhythmically, this Cyrus is good. Variations of pace are communicated well, with the unit delivering plenty of drive and excitement in the process. While truly admirable, there’s also the feeling that it comes at the expense of outright punch – excitement levels are reined in a touch. We’re pretty happy with the soundstaging. It’s impressively focused and nicely layered. Tonally, things err towards the traditional Cyrus leanness – there’s little warmth or richness here, so the treble can turn a little brittle if the rest of your kit has similar tendencies. Compared with earlier iterations of the XP, the Signature is clearer, more fluid through the midrange, and more expressive. It’s certainly more natural-sounding than the last version we heard. Cyrus has long designed upgrade potential into its products and the DAC XP Signature is no different. You can add a PSX-R outboard power supply (£500) to the DAC XP, and that improves things notably. It’s a simple plug-and-play upgrade and it clearly works. All that agility and insight remain undimmed, but the presentation becomes more expansive, while the sound takes on a sizable dose of authority. The bass, which for all its articulation was a little lean, now becomes weightier and more powerful. The overall sound is more dramatic yet more refined and relaxed. We’d consider the PSX-R as an essential purchase if you buy the Signature. Even if you’re not it’s well worth a listen.